If you are looking for a bite-sized, tasty snack that packs a nutritional punch, look no further than the sun-dried apricot. At first glance, apricots may not seem like more than a portable, edible treat, right? The truth is that apricots were first used therapeutically in 17th century England. Here, the apricot oil acted as an herbal treatment for tumors, swelling, and ulcers, according to the book Medical Botany: Plants Affecting Human Health. The apricot has a rich history to add to its delightful citrus flavor. Supposedly, Alexander the Great fell in love with the apricot’s flavor and introduced it to Greece. But in the 17th century, English settlers brought the apricot and its healing properties to the New World, and it is now harvested predominately in California, Washington, and Utah. In addition, here are some of the more contemporary, but little known preventative benefits of our age-old friend, the sun-dried apricot. Many nutrients in the apricot support a healthy heart. They include iron, potassium, magnesium, and beta-carotene. They are also low in sodium. According to the website dovemed.com, this nutrient combination will help to regulate blood pressure. Controlling blood pressure, in turn, could decrease hypertension and prevent heart disease at the source. Also, dried apricots contain fiber, which lowers cholesterol. Six apricots will give you nine grams of this artery-cleansing nutrient. The fiber content of dried apricots alone is purported to keep the circulatory system functioning properly and could help you prevent heart disease now and in the future. In addition to iron, fiber, vitamin C, vitamin B, and beta-carotene, dried apricots are also an abundant source of the nutrient lycopene. You probably know lycopene as the phytochemical found in tomatoes. Lycopene is a carotenoid, an anti-oxidant famous for its bright red color. According to healthline.com, in many recent studies, lycopene may guard against breast, prostate, and skin cancers. Beta-carotene is another carotenoid found in dried apricots and is thought to prevent intestinal and liver cancers. Please note, it is suggested to ingest 5 milligrams of beta-carotene daily for preventative measures, and one apricot has about 1.5 milligrams of beta-carotene. You are most likely accustomed to hearing about the positive effects of carrots on eyesight. If carrots can positively affect vision, the same beta-carotene in dried apricots could aid in maintaining good vision as well. According to an ongoing research study by the National Institutes of Health, the vitamin A in dried apricots may encourage cataract prevention. It is a well-known fact that beta-carotene converts to vitamin A in the body. 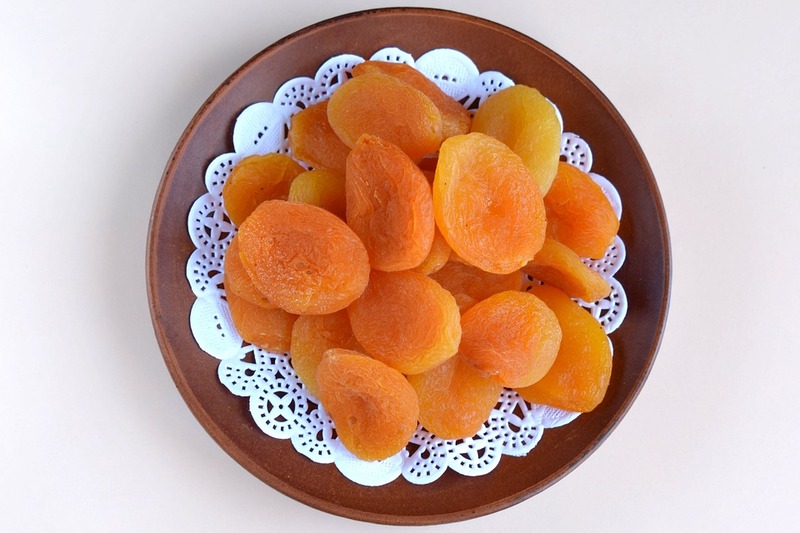 As a source of carotenoids, which converts to vitamin A, and a source of potassium, the dried apricot has a high fiber-to-volume ratio, according to livestrong.com. Apricots also are loaded with probiotics, the good intestinal bacteria, and yeast, allowing for smooth elimination. With both of these additions to the nutritional value of dried apricots, they may be a solid idea when it comes to choosing a natural laxative to relieve constipation or to loosen the stools. There is usually no added sugar in dried apricots, keeping the Glycemic Index low (the system that rates a food’s effect on blood-sugar levels). Sun-dried apricots are quickly eliminated by the body, as well. Apricots are believed to be consumed by some of the oldest living populations in the world. The Hunza peoples are documented to live upwards of the age of 100 or more. Their diet is rich in wolfberries, apricots, and other earthborn nuts and seeds. They live on the outskirts of Pakistan, breathe fresh air, and drink pure water. This population is also known for their success in warding off degenerative diseases, like cancers and heart disease. Could their diet of fruits, berries, and natural living be responsible? It couldn’t hurt to adopt a similar stance. Why not do what the Hunza people do? Besides, the extra vitamin B in dried apricots may protect the brain from Alzheimer’s and other cognitive issues as well. With all of the inferred benefits of dried apricots, you might consider adding them to your arsenal of healthy snack foods. Dried apricots are not as attractive as their ripe, fleshy counterparts, but they are a must to reap the benefits listed above. To purchase, check out your local grocery store’s bulk food section, or like many people do, buy them online. You may be surprised; sun-dried apricots are plentiful. At only 314 calories per one-cup serving, you can easily add them to your cupboard for a tasty, health-preserving snack. If you enjoy their bright color and rich taste, you may even reap many of the side effects listed here. Try them today and see what made Alexander the Great rave.